Kennebunkport, Maine is home to miles of area Beaches, Hiking and Biking trails, Amusement parks, Golfing, Museums and Zoos. As well as Antiquing, Shopping and the freshest seafood on the planet. Anything from fast food to fine dining awaits. Lighthouse enthusiasts will find a number of Lighthouses in nearby Cape Porpoise, Portland, Cape Elizabeth and York as well as historic buildings and The Summer home of George H. W. Bush, Walkers Point. Hemlock Grove Campground is opened from May 15th To October 15th. We take reservations year round by phone and can answer any questions you may have. Advanced reservations are recommended and we offer discount rates for groups of 8 or more. We are Big Rig friendly and offer tent camping and Cabin rentals. We are also a pet friendly campground. We provide clean restrooms with hot showers, cable TV and free WI-FI. Our camp store has all the essentials that you may have forgotten and gifts and clothing to remember your visit by. We offer Propane filling too! Whether you decide to spend your time on property or off. 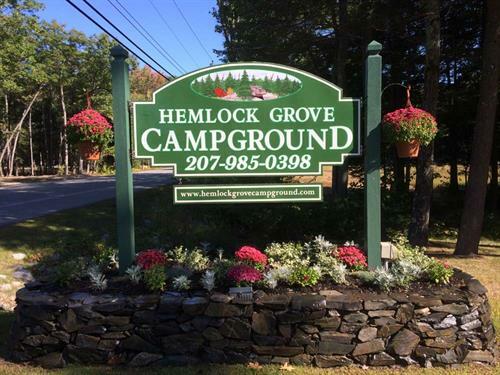 Hemlock Grove Campground is perfectly positioned for the ultimate Maine vacation! From Points North and South take exit 32 (Biddeford) off from the Maine Turnpike. Go straight through the lights and turn right onto RTE 1 South. We are 5 miles on the left after Arundel Ford.